This page is dedicated to Una Pettit and W.E. Romano, Annie Patchell, Jack Wilson, John Young, Meehan baby and all others in the cemeteries of Knik. The 30th day of May 1868, is designated for the purpose of strewing with flowers or otherwise decorating the graves of comrades who died in defense of their country during the late rebellion, and whose bodies now lie in almost every city, village, and hamlet church-yard in the land. What can aid more to assure this result than cherishing tenderly the memory of our heroic dead, who made their breasts a barricade between our country and its foes? We should guard their graves with sacred vigilance. Friends of old Knik is a non-profit group concerned with the treatment of the many Historic cemeteries and graves in the Mat-su area. 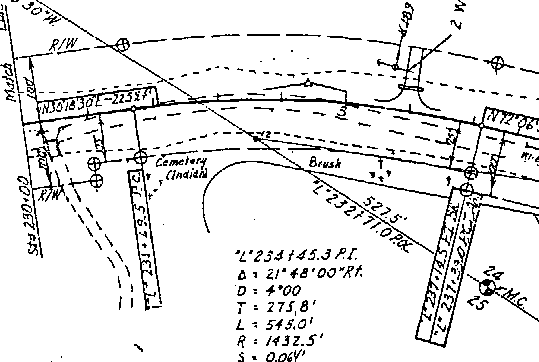 The following maps and documents describe the placement of many of the graves and cemeteries in the Original Knik Townsite, and other areas of the Mat-su borough. "Use of the land as a cemetery may cease only when the cemetery is abandoned under the law - when all the dead bodies are removed OR when the property is so neglected that it completely loses its identity as a cemetery. The cemetery owner or a cemetery association must care for the property." We at Friends of old Knik are proud to start the following projects across the Mat-Su Borough. (research), Matanuska Junction Cemetery, Susitna Station Cemeteries(4)Land Status Research, Ancient Tree Subdivision Lot 10 Block 4 Lot 7,8,9, of Block 5. All these lots are designated Historic by the Borough but they will lose designation if they are sold by Knik Tribal Council and Carol Theodore. "Our modern day hunger and spiritual sickness could be healed, in part, by a greater awareness of our sacred past." "Our future depends on our ability to honor and maintain long-standing spiritual practices." "Sacred sites, environmental and cultural preservationÉit is so important to nuture the spiritual, harmonious, and compassionate aspects of our humanity." "In this fast-paced life, we need sacred sites to remind us of who we truly are; why we are here; and what the purpose of life is." "My background in Art History makes me heartsick when I see the destruction of ancient sacred places." "There are places on this planet Where the sun's rays rush to burn the land, Nothing there to stop them, just the hissing of the sand... Places on this planet where sacred forests used to stand." "Sacred sites are often the focus of my travels and I wish to see these special places preserved for posterity." "I want to do all I can to promote awareness of the need to preserve historical, aboriginal, and spiritual sacred sites." "I respect nature and the belief systems of indigenous people, I fear industrial greed is wiping out important heritages." Why then does the Mat-Su Borough tax cemeteries? The following letter will hopefully change some policies in the Mat-Su Borough. Our group has been trying to get the historic cemeteries listed below off of the tax rolls, and lid foreclosure list. I have communicated with the specific departments and I have gotten no where. Please let us know the best way to get these properties protected. Your cultural resources department is unable or unwilling to add these properties to the list of protected cemeteries. It is against state law to tax cemeteries. I have pointed this out in years past but there has been no change. This information was shared with Sandra Garley last year before she left. She had made our group promises to change these problems. If the only way to make these changes is to speak at an assembly meeting then I will do that, but it would be better to deal with this out of the public eye. 1. uss 239 Tract B Russian Orthodox Cemetery. Currently in foreclosure on the LID list. Should be removed from list so it doesnt get sold in a foreclosure sale. 2. Tax Lot A2 mile 14.5 KGB road. Currently owned by Asbury Moore a private land developer. This property is a native cemetery with many graves from the early 1900's. Visable spirit houses. No cemetery designation. 3. Lot 23-24 Century subdivision. 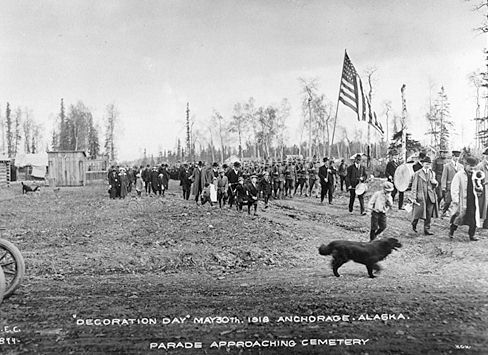 Original Wasilla Cemetery. Owned by Brenda Currier. (John Shadrach) Zoned residential and taxed by the borough and city of Wasilla. This is against state law. no cemetery designation. 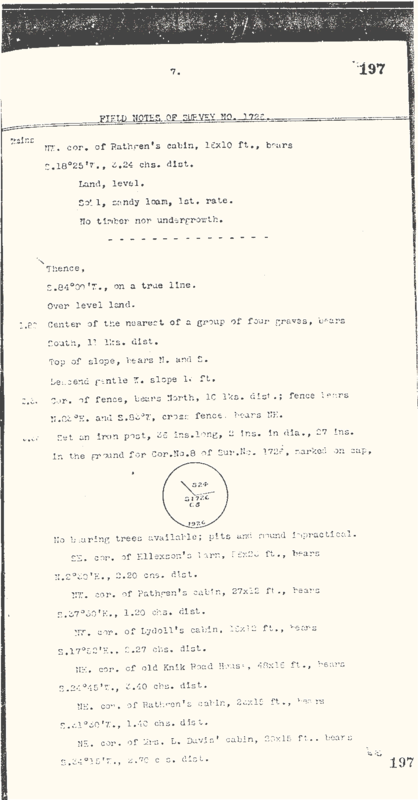 4.Lot 7,8,9 block 5......Lot 10 Block 4 in Ancient Tree subdivision. These should all be classified as cemetery land. Currently it is classified as historic but if the Tribe sells any of the lots they would lose the designation and become a taxed residential cemetery. This summer Carol Theodore(Pauls ex-wife) had 2 of these lots for sale.......There are 3 decades of archeology work done on these lots already and Dr. Yesner informed me that there are graves there, including Chief Wasilla whose grave was tended for many years by the boy scouts of the wasilla area. Fran has work to finish on this project because all artifacts have not been accounted for. per Dr. Yesner. 5. Knik Museum Cemetery- This cemetery was documented by archeologists in the 80's. ( the Reger/Mischler survey)It is now owned by the borough and managed by the Historical Society for the borough. These graves are close to being directly under the Herning Warehouse. Please separate the cemetery land from the museum land and donate it back to Knik Chiefs Foundation or Knikatnu inc. for protection from intrusion. It could be added to lot 6,7,8 of uss 1726. 6. The Iditarod Trail by the Museum crosses over the top of graves. This easement was done as part of ANSCA requirements. Use of the easement should be discontinued and the fence should be removed as it encourages people to use this disrespectful easement. The land is already owned by Knikatnu and they have promised to protect the cemeteries from further intrusion. There is another easement that could be used for the race, it comes off of Knik Lake and bypasses all cemetery land. If anyone receiving this letter is willing to propose the changes needed, we will be happy to provide documentation for all the above statements. The following letter is a reply from the Mayor Tim Anderson. In response to your email of October 27, 2003. I asked the Planning Department to prepare a short summary on the status of each of your concerns. In the first paragraph of your email you state It is against state law to tax cemeteries. According to Borough Staff, the properties you refer to are not classified as cemeteries but as historic grave sites. 1. Regarding USS 239, Tract B, Russian Orthodox Cemetery. This lot was pulled from the Local Improvement District ten years ago. It has come up for review on an annual basis; however, a clerk's deed will not be issued. 2. Tax Lot 2 Mile 14.5 Knik-Goosebay Road is in private ownership. If the property owner wants to survey out his determined grave sites, he may do so , and fill out the state requirements to turn it into a cemetery. 3. Lots 23 and 24 of the Century Subdivision are also in private ownership. Once again, it is up to the private owner to seek cemetery status. 4. Lots 7,8,9,block 5 and lot 10 Block 4 in Ancient Tree subdivision are all tax exempt lots. These lots belong to the Knik Village Council. In August 2003, staff recommended that they vacate the lot lines to create one parcel so that they are not sold individually. The Knikatnu Corpopration said they would pursue that end at a later date. There is one known grave site on Lot 8 block 5, which does not constitute a cemetery, but is an important grave site that needs to be respected. 5. There have been graves identified by Doug Reger (archaeologist) behind the Museum if Herning's warehouse. All graves are being respected by the Historical Society. 6.The Iditarod Trail does indeed cross a known cemetery. 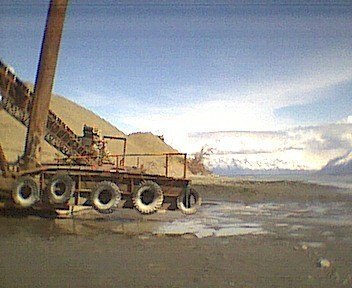 The agreement with Knik was that it could be used only in winter under snow. Staff agrees that a separate trail should be located to avoid the cemetery. It has been discussed with Planning Directors a number of times over the years. An alternative needs to be worked on. This quote comes from the field notes provided with the USS 1726 survery of Knik. This survey includes all the graves in this vicinity most of which are Natives. There are however a considerable number of Native graves scattered all along the shore of Knik Arm from the Westerly edge of Knik down the Arm for several miles. While the survey is executed primarily for the purpose of townsite and cemetery, it is very improbable that Knik will ever have population enough again to warrant subdivision into lots and blocks and so far as I could determine such subdivision is not desired by any of the property owners included in the survey. 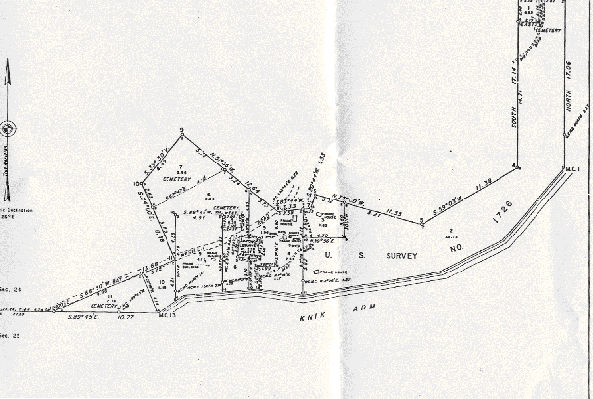 Due to the Native graves being in so many small cemeteries, it necessitated a very irregular shaped survey." Below are the actual survey notes pertaining to USS 1726 corners 7-8. There are 4 graves in this vicinity and we are working to protect them from road impact and from DOT driveway permits. Thanks to Mr. Moore for trying to make good choices about the Knik Native Cemetery(across from Rohn Street in Knik) which is part of a parcel he recently purchased. He is working with the local native groups to make good decisions about this property. Our prayers are with you and the native group. Our plans for the existing cemeteries are to work with State and local governments to designate these parcels as cemeteries on official land records, and all maps. Many cemeteries in the Mat-Su Borough have lost their designation as a cemetery over the years. We are offering Tax deductible receipts to owners of cemeteries that are willing to sign the property over to either Friends of Old Knik or Knik Chief's Foundation. Both groups are working to protect both native and white cemeteries and cemetery property from development and taxation. We have been trying to convince the borough to stop taxing cemetery property. We will work to protect properties that border these cemeteries and we will work to stop further development on Cemetery land. With the recent situation at Alaska Power and Telephone and Summit, we can only pray that some agreement can be made to return this land to the local Natives. This land morally belongs to the Athabascan Natives of Knik. D.C. Wisner, Born July 16,1878 Died Jan. 6, 1912(headboard repainted 10/01, lettering original) Family contacted in Arizona waiting on confirmation. Frank Churchill-Died Aug 19,1937 (ground marker found 10/01) Tree removed 10/01Member Exp.#2. We are hoping to make contact with the family of Frank Churchill from Nova Scotia. Horace Willard Nagley Jr. December 1913-1913(headboard repainted,10/01-Fence repainted 10/01....July 25, 2002 made contact with HW Nagley III. July 26, 2002, spoke with HW. Nagley II in Kirkland Washington, he is the brother of the infant buried here. Permission has been given by the family to add a more permanant marker with the correct dates, and to repair some broken fence boards. Thanks to the Nagley family for contacting us to confirm dates on Horaces' marker. Family members of George Purches have contacted us and confirmed that George was in England in 1881 and worked on the Transcontinental Railway prior to joining the NWMP in 1884. He had family in Edmonton, Alberta, including my grandfather who was just 4 years old when George left for the Yukon in 1896. His great Grandson is now helping us put the puzzle back together. Thank-you Bob and your family for helping us to find the answers. George was shot and killed by John J Kashevnikov in Knik November 1909. 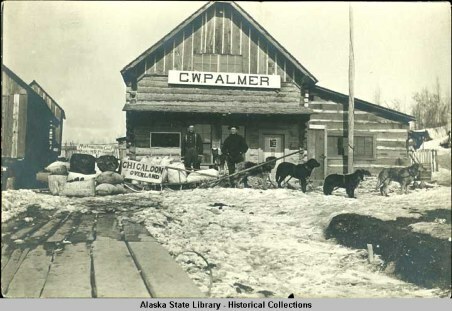 The trial case file #203 took place in Valdez. Cyrus D. Hunter-Death Date May 19, 1914 Died of heart failure per inquest 1914. 2 fenced graves with unreadable markers. 2002- only one unreadable marker now. 40 graves( reported by Chief Paul Theodore, Alice Theodore, and the Reger Document) located apx. 50 feet behind Knik Museum. 24 reported native graves. Impacted by KGB Road and The Iditarod Race Trail. If PLO 2171 would have been followed KGB road would not have been built where it is now. Lot 5 would not exist because it would be part of the buffer around the cemeteries. PlO 2171 required a 330' buffer be provided around all native cemeteries. Mostly natives were buried in the Russian Orthodox Cemetery so all lands around it should have been deeded to the Natives of Knik according to Native Townsite Law and ANSCA. Graves were located here, little evidence of the graves remains. We pray that DOT will not allow any further impact on this property. Develpment on Lot 5 is being discouraged since there are likely graves on Lot 5 also. Lot 5 is where Annie Patchell lived and died by suicide in 1911. This Russian Orthodox Cemetery is designated Cemetery Land at the Borough and at BLM. The Mat su Borough currently has a gas lien on this property. We are working to get the lien removed. A restoration work group is being formed, generous donations from Valley Builders will make this restoration possible. Possible Names include Mrs. McNeil....the wife of Malcolm McNeil.October 9, 1938. This cemetery is being given back to the native group in Knik. Thank-you Mr. Moore for trying to make good choices. Please consider giving the land back to the Chief and the Knik Chief's Foundation. Cannon Hill Cemetery Wasilla (lot 23 &/or 24 Blk 3 Century Park Subdivision.William Moffat was the first buried there in 1923. Many other graves are visible but have been untended for many years. One grave is marked with a cross, a rock and a fence. 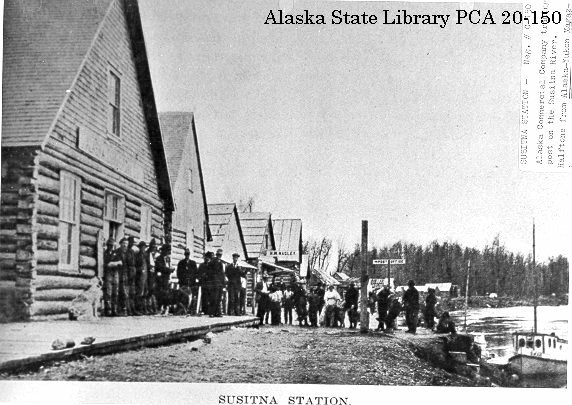 Susitna Station-Lot 8,14, Tract A and Tract C. The last native in Susitna Station was buried in 1965. The funeral was conducted by Shem Pete. The Cemeteries at Tract C and Tract A are owned by the Russian Orthodox Church of Sitka. Lot 8 and 14 are currently owned by the Federal Government . We are asking the Federal Government to give title to these 2 cemeteries back to Knik for protection.